We used our Casserole Crock Pot for this dish but any regular 5-6 quart slow cooker should work just fine. Next we used a can of pork and beans (and LOVED them) but you could substitute a can of chili beans. Then we used a can of Mexicorn but you could use a can of regular corn if you can’t find it. If you don’t like Chili Cheese Fritos, you could also use crushed Doritos or even a buttery cracker. This easy Crock Pot Taco Casserole is a tasty twist to taco night. 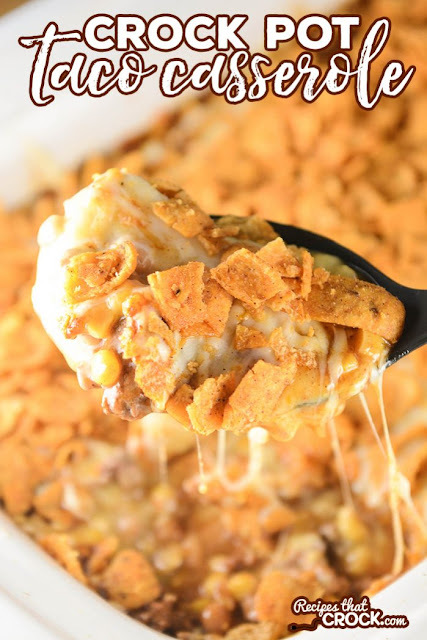 This recipe is a delicious casserole of ground beef, cheese, beans, mexicorn and Chili Cheese Fritos - yum! Mix your water and taco seasoning together and pour over your cooked ground beef. Then pour into your casserole crock pot or 5 to 6 quart regular slow cooker. Next pour your pork and beans and mexicorn on top evenly. Then mix together your soup and milk together and pour on top. Top with cheese and turn on high for 15 min. Top with crushed chips and serve. 0 Response to "CROCK POT TACO CASSEROL"